What links Dagenham, Coventry, Solihull, Crewe and… Chelsea? They were (in some cases, still are) all car manufacturing sites in the UK. Yes, even Chelsea. Dagenham and the rest might have a more significant claim to fame in the history of the UK motor industry, but Chelsea’s Flood Street paid its part. Back in the 1930s, one of the country’s most exclusive sports cars – the S-type Invicta – was made here. Now, more than seven decades after the last example was built in London SW3, Invicta is coming home. A special display at Chelsea AutoLegends – held at the Royal Hospital Chelsea, just a few roads away from Flood Street – pays homage to the rare and rakish Invicta. The display also coincides with the 80th anniversary of Invicta’s win in the prestigious Monte Carlo Rally. Driven by Donald Healey (yes, that Donald Healey), the 1931 triumph by an Invicta S-type was only the second time a British car and driver had won the event. At that time, Invictas were made in Cobham, but by 1933 production had moved to the company’s service depot in Chelsea. With up to 140bhp from its 4.5-litre six-cylinder engine mounted in Invicta’s low-slung sporting chassis, it was capable of topping the magic 100mph. But in line with its advanced specification, the S-type was far from cheap… which was the last thing needed during the Depression. Little wonder, then, that just 11 S-types (and nine A-type saloons) were made at Flood Street before the company closed its doors in 1936. Although there have been a few attempts to revive the marque since, the S-type marks the pinnacle – and the end – of Invicta. A remarkable 68 of the 77 S-types made still exist, a testament to the cars’ quality and appeal and each today is valued at close to a million pounds. At Chelsea AutoLegends (Sunday 4 September), no fewer than eight examples of the S-type will be on display, including the Monte-winning car, a works car successfully driven by famous British driver Raymond Mays, and one example built at Flood Street. “In its day, the Invicta was a genuine rival to Bentley. It was fast and very reliable – as well as its Monte success, the S-type held records at Shelsey Walsh hill climb and at Brooklands,” said James Woods of Chelsea AutoLegends. Chelsea AutoLegends will be packed with other motoring memories, too. The event Patron is Sir Stirling Moss OBE, who will be joined by two-wheel ace Phil Read with other great motorsport names to be announced over the coming weeks. But the cars and bikes will be the real stars. More than 30 classic Le Mans racers will be on display alongside countless other important historic machines. There’ll be displays of the brutal Group B rally cars of the 1980s and the ten most significant road cars of all times. There will be cavalcades of supercars and classic bikes arriving at the show during the day while themed displays include special tributes to the Jaguar E-type – 50-years-old this year – and to some of the British ‘Patrons’, the private race team entrants of the Fifties and Sixties, who took on the factory teams… and often won. Chelsea AutoLegends – patron Sir Stirling Moss – is staged on the South Grounds of the Royal Hospital Chelsea, on Sunday 4 September 2011. This year’s Chelsea AutoLegends builds on the huge success of last year’s inaugural show and once again will centre around a display of iconic cars that have contested the Le Mans 24 Hours, the world’s most famous motor race. Tickets for this year’s Chelsea AutoLegends are now on sale either via the event’s new website ( www.ChelseaAutoLegends.com) or from the ticket hotline on 0844 581 0760. Those pre-booking before the end of July can take advantage of considerable savings with adult tickets priced at £15 in advance rather than £20 on the gate and £10 rather than £20 for 12-16 year-olds. Underlining the event’s family entertainment values, accompanied children aged under-12 will be admitted free of charge. 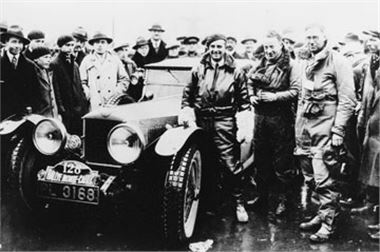 Photo caption: Donald Healey celebrates winning the 1931 Monte Carlo Rally alongside his victorious 4.5-litre Invicta S-Type. A special display of Invicta S-Types will be on show at Chelsea AutoLegends to mark the 80th anniversary of this historic achievement plus Invicta’s local production in Chelsea. Credit: Brian Healey.